For the past two years hip hop fans have been giving raved reviews about Bay Area emcee, Bobo Norco and now he is giving back in return. Norco announced on his Instagram this morning that he will be giving away $10,000 each week to a lucky fan this holiday season. 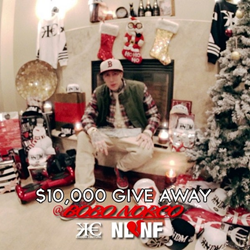 In the video, Norco says, "in honor of the holiday spirit, I was feeling generous", he then fans out ten thousand dollars in cash to the camera, which he will be giving away to one lucky fan. Norco also mentions that he will continue to do this each week throughout the holidays. In the caption section of the post we learn that the entry rules of the contest include; following @BoboNorco and his new clothing line @KNDM on instagram, tagging a friend in the comment section, and re-posing the contest video with the hashtags #BoboNorco, #Contest, and #BoboNorcoGiveaway. The caption also mentions the second and third place prizes which include a one thousand dollar gift card to Sephora cosmetics or fifteen hundred dollars of exclusive merchandise from KNDM.co. The third place winner will receive five hundred dollars in cash. The contest comes on the heels of last month's announcement regarding Norco's upcoming album this February. The album will include features from fellow rap stars; Wiz Khalifa, 2 Chainz, Young Jeezy, Future, T.I., Gucci Mane, and E-40.